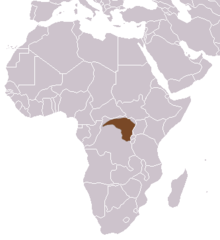 The giant forest genet (Genetta victoriae), also known as the giant genet, is a genet species endemic to the Congo Basin. As it is considered as widely distributed and common, it is listed as Least Concern on the IUCN Red List. The giant genet has a yellowish white short and thick fur with numerous black spots. It is whitish on top of the muzzle and between the eyes. From behind the ears two dark bands run backwards, and a black stripe runs along the spine. Its long bushy tail has broad black and six narrower white rings and is black on the tip. Measurements of museum specimen range from 550 to 600 mm (22 to 24 in) in head and body with a 413 to 490 mm (16.3 to 19.3 in) long tail. ^ a b Gaubert, P.; Dinets, V. & Do Linh San, E. (2016). "Genetta victoriae". The IUCN Red List of Threatened Species. IUCN. 2016: e.T41703A45219531. doi:10.2305/IUCN.UK.2016-1.RLTS.T41703A45219531.en. Retrieved 30 October 2018. ^ Thomas, O. (1901). "On the more notable Mammals obtained by Sir Harry Johnston in the Uganda Protectorate". Proceedings of the Zoological Society of London. 2 (2): 85−90. ^ Van Rompaey, H. and Colyn, M. (2013). Genetta victoriae Giant Genet. In: J. Kingdon and M. Hoffmann (eds.) The Mammals of Africa. V. Carnivores, Pangolins, Equids and Rhinoceroses, pp. 249–250. Bloomsbury, London, UK. This page was last edited on 12 April 2019, at 13:19 (UTC).